I am a huge fan of entering blog contest as a way of finding new products to try and products I can give family and friends to try. I have entered many giveaways to win a Fresh Baby So Easy Baby Food Kit, I never won a set but I did learn about a great new company. Since my son is no longer a little baby he does not need puree so I thought the So Easy Toddler Cookbook would be perfect for him. The book is filled with so many great recipes, colorful photos and feeding tips. I loved the smoothies, my son loved the breakfast burritos and his favorite the rice and broccoli casserole. He seems to favor savory over sweet, I am grateful for it I just have to learn I might be the only smoothie fan in the house. I had fun making the recipes because I tried to include my son. I put him in his feeding chair and let him watch what I was doing and I let him try the individual ingredients before I made any finished items. We had a great time exploring new flavors and textures. I know for me I was a bit puzzled as to where do I start with introducing my son tasty and healthy food now that he is no longer a jar food baby. Of course I know the dos and don'ts of feeding I just wanted a go to cookbook that I could reference anytime. I know in the future I will change and add to recipes as I see my son's likes and dislikes develop. I definitely would recommend this cookbook for a new mom to have a guideline of recipes to start with or a mom who just wants new ideas. In honor of my son's 1st birthday Fresh Baby has agreed to send one of my lucky readers the So Easy Toddler Food Cookbook. *Limited to US residents; 18 years old and above. Giveaway starts November 30, 2010 and ends December 10, 2010 at midnight PST. Winner will be emailed and has 48 hours to respond before another winner is selected. I was not paid for this giveaway or post. 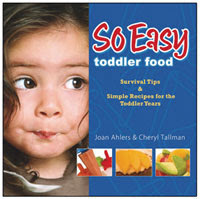 I was sent for free one copy of So Easy Toddler Cookbook to review for this post. My favorite product is the Toddler Cookbook!